Why is suicide prevention important? Suicide was the most common cause of fatal injuries among Hawaii residents over the 5-year period 2010-2014, accounting for over one-quarter (908, or 26%) of all fatal injuries. Suicide was the leading cause of injury-related death for most age groups — all but the very young and the very old — outpacing car crashes, homicide, unintentional poisoning and drowning. One person dies by suicide in Hawaii every two days. Q: Why do people attempt suicide? A: People usually attempt suicide to block unbearable emotional pain, which is caused by a wide variety of problems. It is often a cry for help. A person attempting suicide is often so distressed that they are unable to see that they have other options. We can help prevent a tragedy by endeavoring to understand how they feel and helping them to look for better choices. Suicidal people often feel terribly isolated. Because of their distress, they may not think of anyone they can turn to, furthering this isolation. In the vast majority of cases someone who attempts suicide would choose differently if they were not in great distress and were able to evaluate their options objectively. Most suicidal people give warning signs in the hope that they will be rescued because they are intent on stopping their emotional pain, not on dying. Q: Are people who attempt suicide mentally ill? A: No. Having suicidal thoughts does not imply that you are mentally ill. People who attempt suicide are often acutely distressed and the majority are depressed to some extent. This depression may be either a reactive depression which is an entirely normal reaction to difficult circumstances or may be depression which is the result of a diagnosable mental illness with other underlying causes. Or it may also be a combination of the two. The question of mental illness is a difficult one because both these kinds of depression may have similar symptoms and effects. So whether a person who is distressed enough to attempt suicide would be diagnosed as suffering from clinical depression may vary among individuals and cultures. Q: Doesn’t talking about suicide encourage it? A: It depends what aspect you talk about. Talking about the feelings surrounding suicide promotes understanding and can greatly reduce the immediate distress of a suicidal person. In particular, it is appropriate to ask someone if they are considering suicide, if you suspect that they are not coping. If they are feeling suicidal, it can come as a great relief to see that someone else has some insight into how they feel. Q: What sort of things can contribute to someone feeling suicidal? Q: How would I know if someone I care about is thinking about suicide? sudden change from extreme depression to being `at peace’ . This may indicate that they have decided to attempt suicide. Q: What can I do if someone I care about is thinking about suicide? Suicidal people, like all of us, need love, understanding and care. People usually don’t ask “are you feeling so bad that you’re thinking about suicide?” directly. Locking themselves away increases the isolation they feel and the likelihood that they may attempt suicide. Asking if they are feeling suicidal has the effect of giving them permission to feel the way they do, which reduces their isolation. If they are feeling suicidal, they may see that someone else is beginning to understand how they feel. Q: How do telephone counseling and suicide hot line services work? A: Different services vary in what they offer, but in general you can call and speak anonymously to a counselor or therapist about any sort of problem in a no-pressure context that’s less threatening than a face-to-face session. Talking the situation over with a caring, independent person can be of great assistance, whether you’re in a crisis yourself, or worried about someone else who is, and they usually have connections with local services to refer you to if further help is required. You don’t have to wait until the deepest point of crisis or until you have a life-threatening problem before you seek help. Myth: Suicides peak during holidays. Fact: Most people think the winter holidays are a risky time, but suicides are lowest in December and peak in the spring. Myth: Depression is always the cause of suicide. Fact: Two of every three people who commit suicide are depressed at the time they take their life. However, alcoholism plays a role in 1 in 3 completed suicides. Major depression is the psychiatric diagnosis most commonly associated with suicide, with about 20 times the risk found in the general population. With more active screening and treatment, depression carries less of a stigma now, but it remains one of the big risk factors for suicide. Myth: Teens are at greatest risk for suicide. Fact: Teenage suicides make headlines, but the elderly are more likely to take their own life than any other age group. At particularly high risk are white men over the age of 85, who have a suicide rate of 49.8 deaths per 100,000, compared with about 14 per 100,000 in people over 65, and 11 per 100,000 in the general population. Myth: Caucasians attempt suicide more often than other races. Fact: Suicide is more common among whites in the U.S. than blacks, Asians, or Hispanics. No one is quite sure why whites are at a higher risk. It might have to do with differences in social support. The only group at higher risk is American Indian/Alaskan Natives, who have a suicide rate of 14.3 per 100,000 compared to 13.5 per 100,000 for whites and about 5 to 6 per 100,000 for other groups. Myth: Your family affects risk. Fact: A family history of depression increases the chances that a child will suffer the same by a factor of 11. But family members and friends can also play a significant role in preventing suicide. Strong social support is known to lower suicide risk. Myth: Suicides can trigger ‘copy cat’ attempts. This link has initiated the development of new guidelines for responsible journalistic reporting. For example, journalists now typically refrain from going into detail or sensationalizing death from suicide. Journalists often end an article with a reference to a hotline so that distressed people reading it will reach out for help rather than being tempted to emulate. The Prevent Suicide Hawaii Task Force (PSHTF) is a state, public, and private partnership of individuals, organizations, and community groups working in the area of suicide prevention. PSHTF members collaborate to provide leadership, set goals and objectives, develop strategies, coordinate activities, and monitor the progress of suicide prevention efforts in Hawaii. 2015 – The Youth Suicide Prevention Leadership Council was formed in April of 2015 and has 80 members (50 youth and 30 supportive adults) from across the state. The statewide, youth-led initiative was formed to: provide a youth voice for statewide suicide prevention work; provide leadership development and training for youth on suicide prevention as well as general community leadership skills; provide civic engagement and community service opportunities for youth and; connect council members with adults who will support them as leaders in their home communities. Contact Mara Pike at Mara@mentalhealth-hi.org for more information. 2014 – The newly formed American Association of Suicide Prevention, Hawaii, in collaboration with the DOH Injury Prevention Branch, sponsored two major events: “Out of the Darkness” walks on the islands of Oahu, Maui, Kauai, and Hawaii in September and; the first ISOS (International Survivors of Suicide) mini-conferences to bring survivor families together and to provide support. 2012 – 2013: Implementation of ASIST and safeTalk trainings statewide to enhance the proportion of individuals statewide who have the skills to intervene with someone who may be at risk for suicide. 2012 – 2013 : Implementation of “safe messaging” for at-risk youth in Hawaii. Messages are being developed for this population based on the results of focus groups held in 2012 with youth at risk and their peers on Oahu. Dissemination of these recommended messages will occur in 2013, based on recommendations of media to be utilized to distribute messages. 2012 – 2013: The Bullying Task Force – a coalition developed from Senator Suzanne Chun Oakland’s Keiki Caucus – is preparing legislation that will be introduced in the 2013 Hawaii state legislature to ensure that all public and private schools statewide develop trainings, policies and procedures to address bullying in their schools. 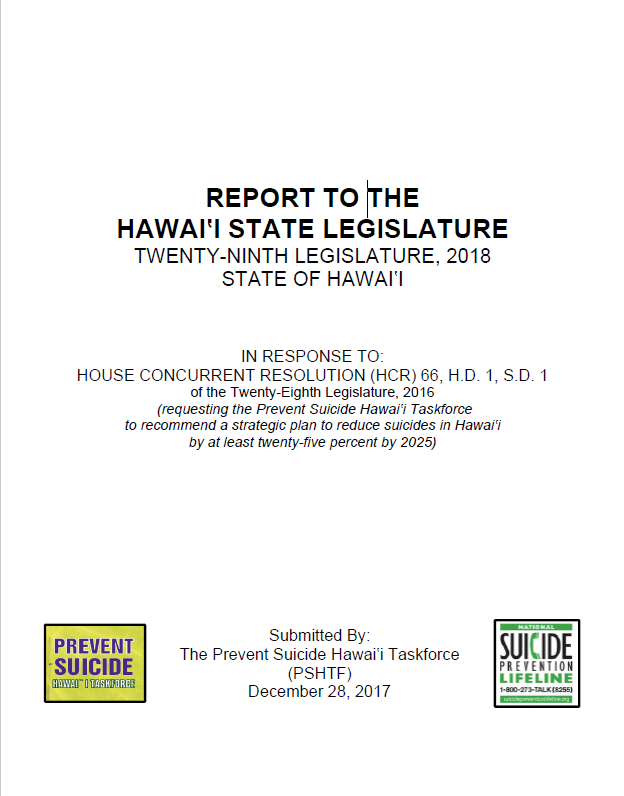 The Prevent Suicide Hawaii Taskforce (PSHTF) is a state, public and private partnership of agencies and community groups working in collaboration to provide leadership, develop strategies, coordinate activities, and monitor progress of suicide prevention efforts in Hawaii. The PSHTF collaborates with the State Department of Health Injury Prevention and Control Section (DOH/IPCS) in planning and implementing these activities. An important component of the PSHTF are the Island Task Forces that coordinate culturally appropriate activities for each of the neighbor islands/areas: West Hawaii, East Hawaii, Maui, and Kauai. The PSHTF and Island Task Forces provide leadership for suicide prevention activities statewide, including for National Suicide Prevention Week and for the suicide prevention conference. Other PSHTF activities include the statewide Prevent Suicide Hawaii Listserv that provides information to 200 members on a regular basis and the bi-monthly meetings of the PSHTF to address suicide prevention issues statewide. Meeting time and location of PSHTF: Queen’s Conference Center, Room 203, corner of Punchbowl and Beretania Streets, 3rd Thursday, every other month from 2:00pm – 4:00pm. Confirm date and location of meeting, as times and location may change.